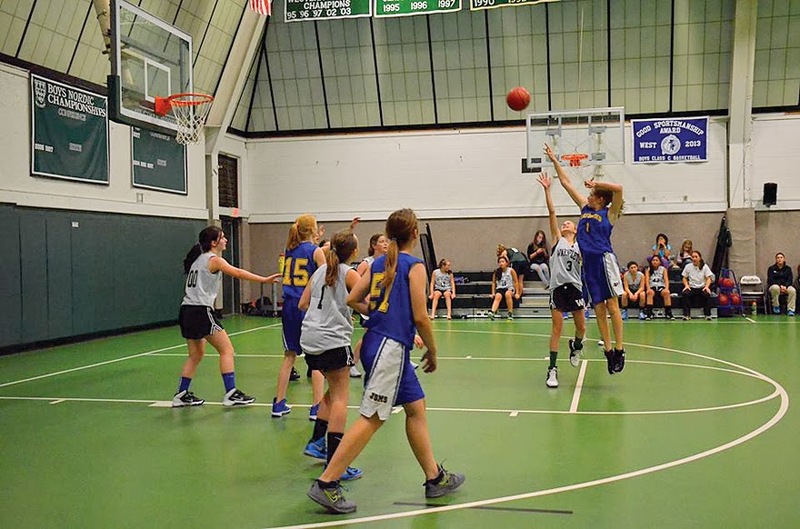 What a week for the JSMS basketball teams, as the A and B girls and boys teams endured a 10-game combined schedule. The B teams got the week started on Monday, by traveling to Durham. The B girls have been hampered with injuries this season, and have had to call on some A players to fill the roster. In a tight game from the start, the Lady B Roadrunners got some timely offense to hold a 16-11 lead late in the fourth, said girls B coach Lynne Latham-Estey. Durham drained a 3-pointer to pull within two, but the defense of Sophie Sangster, Tabby Newquist and Eliza Martin closed the door in the final minute. Leading the balanced offensive charge were Torii Schmader, Carlee Richmond and Kaitlyn Geddicks with four points apiece. Maegan Vierra and Grace Schmader each had a bucket in Raymond's win, 16-14. In a back and forth affair, Raymond's B boys jumped out to an early 8-7 lead after the first quarter, said B boys coach John Dionne. Both teams put the brakes on in the second quarter, as the defensive intensity picked up for each side, and the Roadrunners held a 10-9 halftime advantage. Durham came out in the third quarter with some offensive punch and outscored Raymond 12-6 to take control, and eventually the game, 28-22. "One of the most enjoyable games I've ever coached, the boys fought hard but came up just short," Dionne said. Andrew Wing led the offense with eight points, Blake Colby chipped in with six, while Cooper Gaudet, Stearns Wallingford, Devon Griffeth and Colby Dionne all had two points apiece. 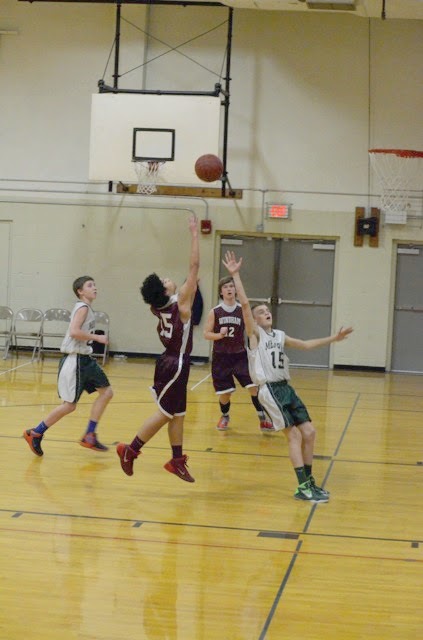 Sticking with the B teams, they closed the week on Friday, by hosting Oak Hill at JSMS. Still battling injuries, the girls B team ran into a fast-paced offense by Oak Hill. Paced by a sharpshooter, Oak Hill jumped out to a comfortable lead, and never looked back, winning 33-16, said B coach Latham-Estey. Raymond's strong defense and numerous rebounds prevented many more baskets. Sophie Gardner and Carlie Steele led the offense with four points apiece. Payton Hutchinson, Hannah Stogsdill and Maegan Vierra all got into the score column as well. Eliza Martin, Riley Gardner and Grace Schmader demonstrated great presence on the hardwood for Raymond, now 2-3 on the season. "I’m very proud of the girls with their continued great effort and great sportsmanship in victory or defeat. They represent their town and school very well," said Latham-Estey. 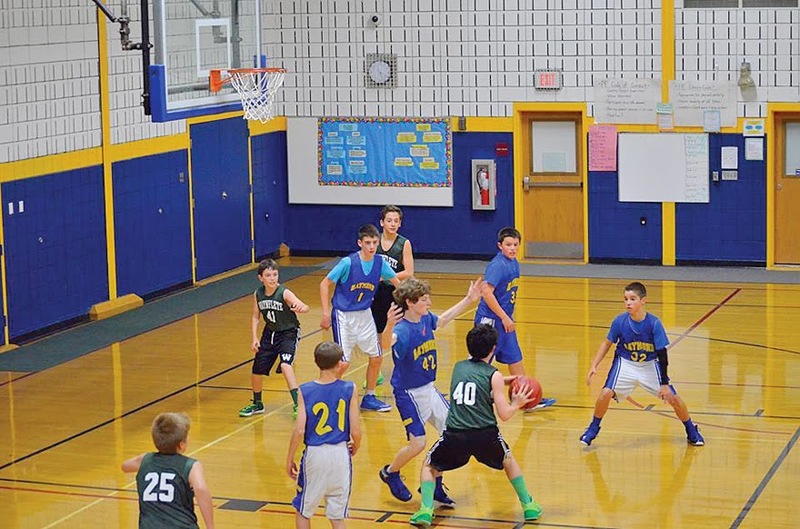 In Friday's nightcap, the B boys faced a tough Oak Hill team. Oak Hill raced to a 12-4 lead to start the second quarter. In the second, Raymond's Andrew Wing caught fire with seven points, and Colby Dionne added a bucket to pull the Roadrunners within seven at halftime, 20-13, said coach Dionne. Coming out with a defensive plan, the Roadrunners held Oak Hill’s high scorer scoreless in the third. Catching fire once again, Raymond's Wing poured in seven more in the fourth quarter. He was helped by Cooper Gaudet, who added two big buckets. Jon Lawlor and Colby Dionne each added two points apiece, but Raymond came up just short, losing 35-34 in a wild game. Andrew Wing led all scorers with 18 points. Cooper Gaudet and Colby Dionne each poured in six, while Stearns Wallingford and Jon Lawlor both had two points. The B boys slip to 1-4. The JSMS A teams played three games during this past week. Starting on Tuesday, they traveled to Durham to take on the Tigers. The A boys got things going, and the pace was fast from the opening tip. Both teams displayed hot shooting and were up and down the court so fast, the crowd's heads were turning like watching a tennis match. Durham held a 10-8 first quarter lead, but it was a sign of things to come. Both teams kept up the trading of baskets till halftime, with the Tigers leading 19-16. More offense in the third quarter, as it was shaping up to be a thriller. To start the fourth, Durham was still ahead, 27-24. Turning it up a notch, Raymond came out in the fourth and dropped 15 points to take a lead 38-35 with time winding down. Durham's C. Stewart-Staples, who had 12 points in the first three quarters, nailed a 3- pointer with 11 seconds to go, throwing the home crowd into a frenzy. Raymond could not answer in the final seconds, and fans from both sides were treated to free basketball---overtime. Andrew Wing hit a jumper to give the Roadrunners the lead 40-38 with 55 seconds to go in overtime. Durham had a chance to tie from the charity stripe, but managed only one free throw. With a playoff atmosphere-type crowd, Raymond held on to win 40-39. Wing led all scorers with 17 points. Jake Conley added six, while Jack Bisson, Alex Wilkins and Kyle Sullivan all had four points apiece. Credit Derek Foss with a huge 3-pointer in the fourth quarter for the Roadrunners. 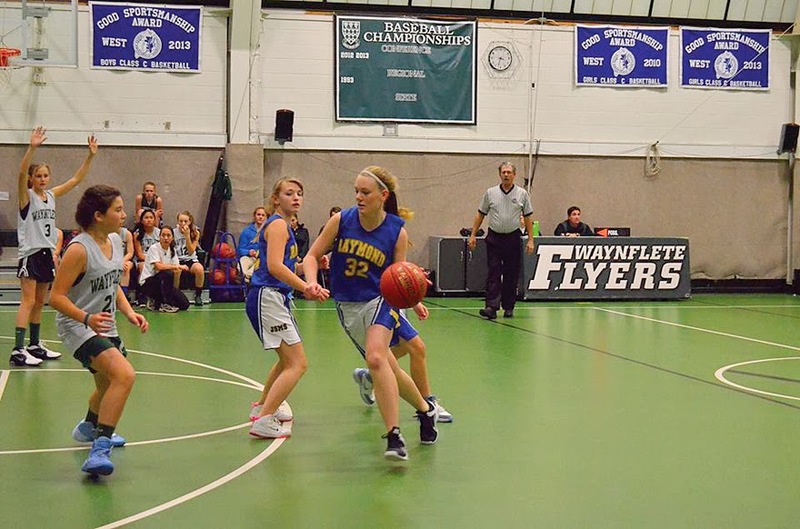 Following that, the Raymond A girls faced a tough Lady Durham team and fell behind in the second quarter, after having an 8-5 first quarter lead. Durham's speed and height took control the rest of the way as Raymond struggled to get into any offensive flow. The Lady Roadrunner scrappy, never-give-up defense prevented Durham from scoring a lot more, but eventually fell 33-13. Carlie Steele and Hannah Stogsdill paced the offense, while Sophie Sangster, Grace Schmader and Tabby Newquist grabbed several rebounds and made it tough on Durham's star players. Wednesday arrived and the A teams found themselves at home, hosting St. Dom's. The A girls went first and set the tone early on the Lady Saints, leading 8-5 after one. Carlie Steele paced the Lady Roadrunner offense, as the defense was led by Hannah Stogsdill, Sophie Sangster and Grace Schmader. St. Dom's made a charge in the fourth, but baskets by Steele and Sophie Gardner sealed the deal for Raymond, winning 19-13. Coach John Powers spoke highly of his team. "This team works tremendously hard and I’m very proud of each and every one of them." The Raymond A boys hit the floor with St. Dom's and raced out to a 8-4 lead at the end of the first quarter. In the second, St. Dom's literally caught fire and exploded for 17 points, while Raymond managed only two, and were down at the half 22-10. St. Dom's kept up the offensive pace with 15 more in the third, and held a 37-21 advantage, but Raymond scored 11 of their own. Not giving up, the Roadrunners started a comeback by scoring 12 fourth quarter points to St. Dom’s five, but fell just short, losing 42-33. Alex Wilkins led Raymond with seven points, while Jake Conley added six. Andrew Wing scored five and Derek Foss hit three free throws for the Roadrunners. In Thursday's action, the A teams travelled to Old Orchard Beach. With the third game in a row in as many days, combined with a long bus ride, the A boys came out not up to par. Add to that a very slippery surface in which to play, and the boys had their work cut out for them. Down 21-14 at the half, Raymond was by no means out of the game. Managing only four third quarter points, the Roadrunners fell behind 28-18 to start the fourth. 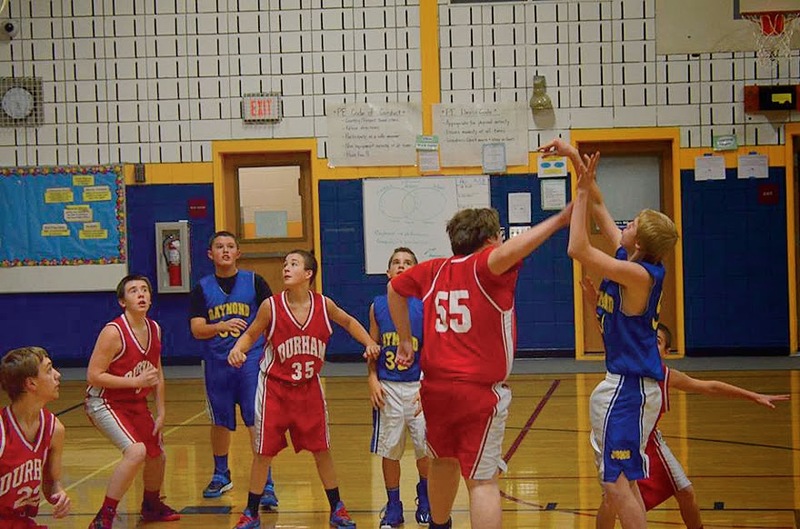 As the conditions dictated the game, neither team could hit any shots and Raymond lost 29-20. Alex Wilkins again led Raymond with seven points. Derek Foss added six, while Jake Conley chipped in with four. The A boys dip to 3-5 on the season. The Lady A Roadrunners took the very same slippery court conditions, but made the most of it. In a wild game with dozens of tie ups and players constantly on the floor, the score was 8-8 for much of the second half. The Lady Seagulls sank a 3-pointer with five minutes to go in the fourth, but Raymond's Torii Schmader answered with a three of her own with 3:30 remaining to tie the game at 11. Back and forth, both teams were very physical in wanting the ball down the stretch. With 45 seconds to play, OOB got a loose ball bucket to go ahead by two, and later added a free throw to win 14-11. The Raymond A girls fall to .500 on the season, at 4-4. "Our girls never quit despite the conditions and how loosely the game was called, especially in the fourth quarter," added Powers. The B teams get back in action January 23rd, away at Durham. The A teams hit the hardwood January 28th, home versus Durham. With 23 ski racers on the team, the Windham High School alpine team is taking former recreational skiers and making them into competitive racers. There are 15 boys and 8 girls on the team, all of whom compete in slalom and giant slalom during the meets, which take place at Shawnee Peak. Giant slalom (GS) is where the skiers reach higher speeds as they ski through further apart two-poled gates that are hung with a banner. Slalom is done on shorter skis through poles that are close together. The skier only makes one turn before entering each gate. The meets are held at Shawnee Peak in Bridgton and started after the new year. The first GS race took place last week. “Despite firm, challenging snow conditions, the Windham Alpine Team had a very promising first GS race of the season. The boys came in second overall (Marshwood first) behind strong performances from Jack Brockelbank (fifth place), Johnny McAvoy (15th), Brandon Palmer (17th) and Kyle Joseph (19th),” said coach Gavin Glider. “The girls team continues to show promise with a fifth place finish (out of six). Our scoring racers were Carly Chasse (eighth), Cassie Symonds (11th), Liz Mycock (25th) and Meagan Jones (26th),” said Glider. The team began in 2002 with one racer and in 2003 had its first full team with seven. The team competes in the SMAA conference against Kennebunk, Cheverus, Gorham, Scarborough and Marshwood. The top racers who show potential in slalom after one meet are Jack Brockelbank and Garrick Rogers for the boys and Cassie Symonds and Elizabeth Mycock for the girls. Glider’s team philosophy is to “achieve at our highest level whatever that might be and work our hardest to achieve it.” He also encourages good sportsmanship. The ski team won a sportsmanship banner in 2011. “The way we conduct ourselves is more important than the results we achieve. It’s nice to win, but it’s nicer to win with dignity,” Glider said. The team is partially funded by RSU14. Lift tickets are purchased for the team for practices and races. The athletes provide their own equipment and the coach along with assistant coach Jennie Butler are looking for opportunities for fundraising and sponsorship to aid in the purchase of uniforms for next season. Sponsors would be embroidered on the jackets, Glider said. Upcoming races are the division championship on February 14 and the class A State meet on February 27 and March 1 all at Shawnee Peak. In February I decided that I needed to make a change. I felt terrible about myself, disgusted about how much weight I had gained over the years, and terrified about how unhealthy I was. I was very overweight, on blood pressure medicine and had been a smoker for many years. My best friend had asked me to be her maid of honor in her wedding in September and I knew that I wanted to look and feel better for her big day. I took the plunge and decided that I was going to get healthier for myself so that I could be around for my daughter and her children for a long time. 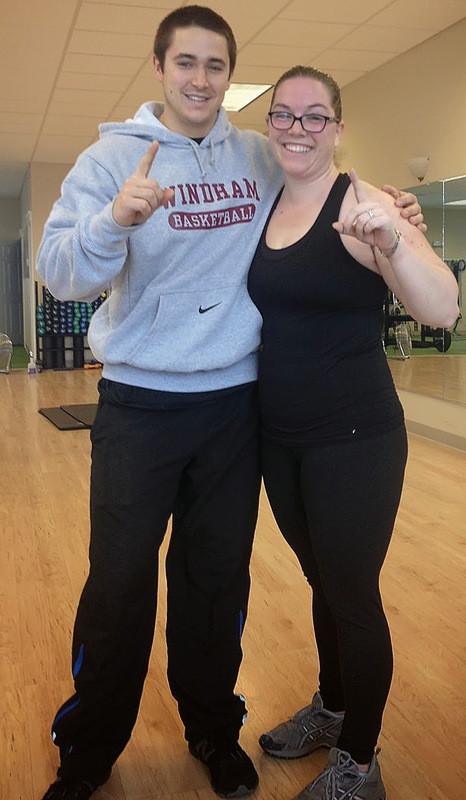 I met with Travis at PNF for a personal training session and was mortified when I weighed in at 193 pounds with a body fat percentage of 34.5 percent (overweight). I could barely do the fitness tests to get started on the first day. I knew that this is what I needed to get healthier, so I signed up to do the introductory three sessions and decided to quit smoking. I decided to sign up for the 12 sessions with nutrition plan since my diet was terrible. I relearned how to eat healthy, check my portion control and see what my body needed every day. I worked with Travis twice a week and followed his nutrition plan. Travis was amazing and never made me feel like I wasn't doing enough. He worked with me and made sure I was pushing myself enough, but not too much. Fast forward to September (the wedding) I had lost 35 pounds and down to 23 percent body fat! I felt amazing, better than I had since before my daughter was born nine years prior! I felt so great and didn’t want to stop and risk falling back into bad habits. I kept going to PNF to work with Travis and started the outdoor boot camp which I did two rounds of because I loved it so much. I work out five to six days per week now doing videos at home along with at least one session per week with Travis. I am so glad that I decided to pick up the phone and call PNF in February. I now love working out, the harder the program the better! Since February I have lost almost 40 pounds, 22 inches and am at a 20.6 percent body fat. In almost one year I have changed physically and mentally. I am so much stronger than I thought I could ever be. Thank you Travis and PNF for helping me achieve my goals and surpass what I thought was impossible! The Windham gymnasium was packed with fans for Friday night’s game. Windham took on top-ranked Bonny Eagle. Windham was going to have to play one man short due to Spencer Hodge being out with ankle injuries he acquired in Thursday nights practice. The game started out with Windham scoring first and taking the lead right off the bat. Top Bonny Eagle player Dustin Cole missed his first few shots giving the Eagle fans some extra excitement. With the score 12-12 early in the second quarter, Bonny Eagle hit three straight 3s. The Scots led 27-16 at the half. Windham had some pushes in the second half that gave them and the crowd hope. Markus D’Andrea and C.J. Berthiaume led the 3rd quarter of the game with their efforts and shots on basket but Bonny Eagle stayed on top of the score board. A three point play by D’Andrea made it a seven point game. The Eagles had a few chances to make it a closer game, several of their shots missed when hitting the rim. The Eagles made several strong moves to the basket but couldn’t pull through and score. Bonny Eagle eventually found their groove and won with a 60-43 victory. The Eagles played a good game and with a key player like Spencer Hodge missing, they could feel the loss. 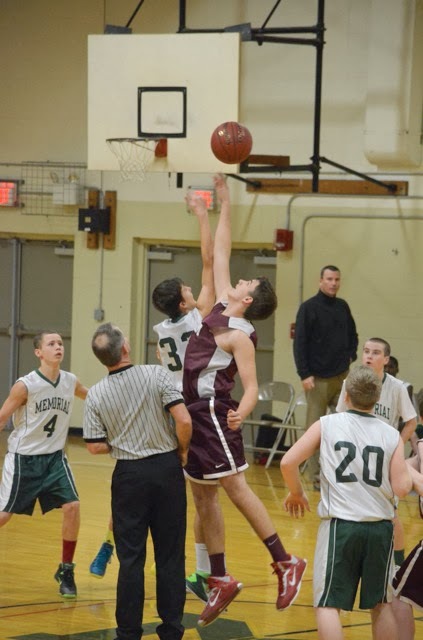 Windham traveled out of town to Memorial Middle School in South Portland Monday afternoon. When walking into these “older” schools and climb the rickety wooden bleachers, there is a sense of ‘old’ school. The ceilings are high and the ventilation system is loud, but once the game starts you know you are in a gymnasium, new or old, it doesn’t matter. The game started out slow with both teams scoring minimum baskets, but as the second period started so did the speed of the game. Both teams seemed to come off the weekend lull, ending the first half of the game with the Eagles in the lead. Coming back on to the court to begin the second half both teams ramped up their game. The referees were not calling a lot at this point which allowed the game to progress faster. Windham ended the third period with a 10 point lead. However, the Wildcats came back and tightened the gap in the fourth period. With two minutes left in playing time the lead continued to fluctuate between both teams. The referees made more calls and Memorial took a two-point lead on foul shots that ended the game. This was Windham’s second loss of the season ending their seven game winning streak. The fans agreed the boys played a great game and should be proud. The team’s next home game is on Thursday, January 23rd against Scarborough at 4:45 p.m.